Club Rowing traveled to Philadelphia, Pennsylvania on Saturday, October 28th to compete in the Head of the Schuylkill Regatta. The novice boat's lineup was Megan Mortenson (stroke), Sophia Asofsky (3), Tony Beres (2), Kristen Kalish (bow) and Wendy Markert (cox). The varsity boat's lineup was Olivia Marine (stroke), Laura Wood (3), Lauren McCarthy (2), Wendy Markert (bow) and Hannah Nathanson (cox). Both boats placed first in their respective heats. There was a total of 25 boats in the novice race and 45 boats in the varsity race. Club Ice Hockey traveled to World Ice in Flushing, New York to take on the newest member of the MCHC, the Maritime Privateers on Saturday, October 28th. Maritime scored the first goal of the game halfway through the first period, but it was answered quickly by Brandon Fauci. Maritime would score another goal before the period ended to make it 2-1. In the second period, Hofstra scored 3 times, twice by Andrew Gagnon and once by Austin Natale, and would end the second period leading the Privateers 4-2. In the third, Maritime came out quick with constant pressure, but Hofstra was there to stop most of it, only allowing a goal with 6 minutes left in the game. Maritime pulled their goalie and with the net empty, Andrew Gagnon scored the final goal to complete his hat trick, the first of his college hockey career. Hofstra won by a score of 5-3. The Pride had a quick turnaround as they played Ramapo College at Sport-O-Rama in Monsey, New York on Sunday, October 29th. In the first period, Ramapo would notch a couple of goals to jump out to a 2-0 lead after 20 minutes played. In the second, Ramapo took multiple penalties and gave the Pride the chance to even the score on the powerplay. Hofstra capitalized on two goals scored by Matt McGuirk and Zack Lamberti. Ramapo would score another goal to end the period up 3-2. Early in the third, Andrew Gagnon remained hot and scored yet another goal to tie the game at 3. However, the Roadrunners would be too much for the Pride on this day, as they quickly responded with a 5-goal run to finish off Hofstra by the score of 8-3. 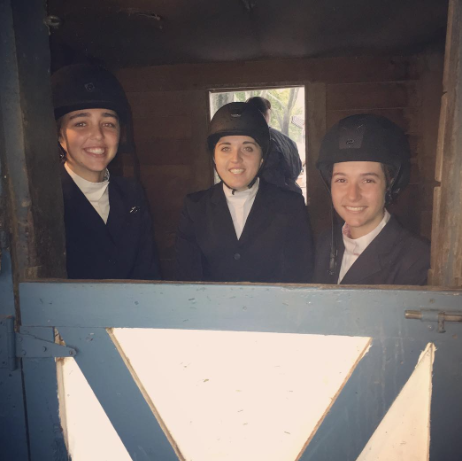 Club Equestrian traveled to Thomas's School of Horsemanship in Huntington, New York on Sunday, October 29th. Kate Milford placed second in both novice fences and novice flat. Katie Rozek placed fourth in novice flat. Petra Srnec placed third in novice fences and sixth in novice flat. Hannah Matuszak placed fifth in her flat class and Julia Shalov placed fourth. Club Rock Climbing held their weekly climb at the original Brooklyn Boulders in Brooklyn, New York on Saturday, October 28th. The club collected dues to donate to the Access Fund, a non-for-profit rock climbing advocacy group who dedicate their time to keeping climbing areas open and taking care of the environment. 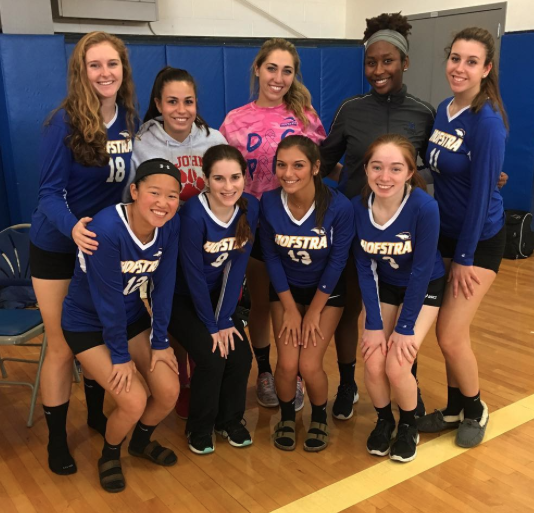 Women’s Club Volleyball hosted their first ever home contest against Stony Brook University on Saturday, October 28th in the Hofstra Fitness Center. Although the team dropped a tight match against the Seawolves, the event was a success as they raised money and awareness for breast cancer research. 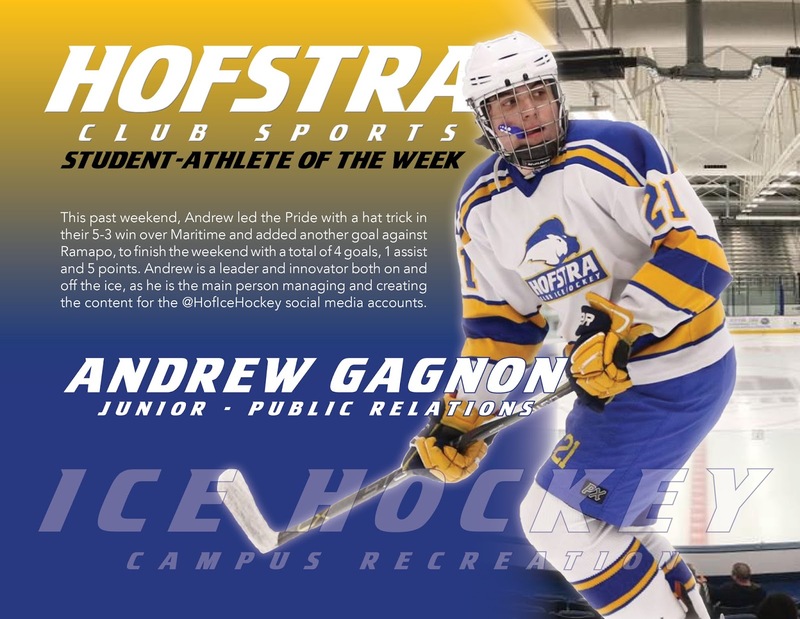 This past weekend, Andrew led the Pride with a hat trick in their 5-3 win over Maritime and added another goal against Ramapo, to finish the weekend with a total of 4 goals, 1 assist and 5 points. Andrew is a leader and innovator both on and off the ice, as he is the main person managing and creating the content for the @HofIceHockey social media accounts. Congratulations to Andrew!